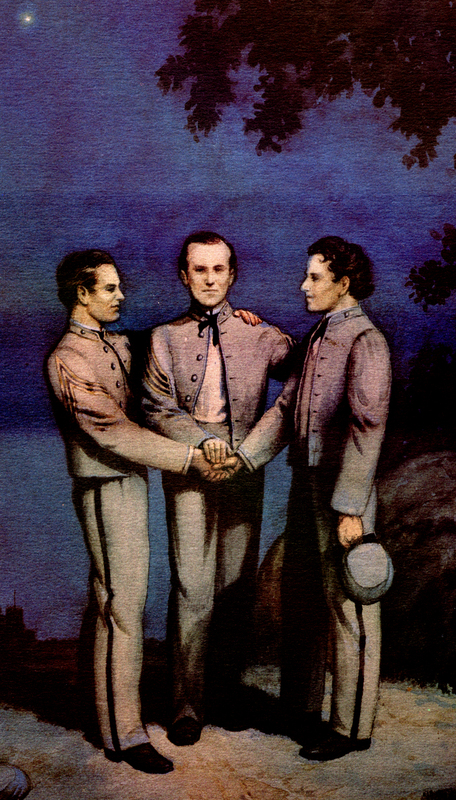 Sigma Nu was founded by three cadets at the Virginia Military Institute during the Reconstruction period after The Civil War. Sigma Nu represented a radical departure from the times. The system of physical abuse and hazeing of underclassmen at VMI led to James Frank Hopkins, Greenfield Quarles, and James McIlvaine Riley to form the "Legion of Honor" which soon became Sigma Nu Fraternity. The story of Sigma Nu began during the period following the Civil War, when a Confederate veteran from Arkansas enrolled at the Virginia Military Institute in Lexington Virginia. That cadet was James Frank Hopkins, and it is to him, Greenfield Quarles, and James McIlvaine Riley that Sigma Nu owes its existence. When Hopkins enrolled at VMI, the south was in a state of turmoil and just beginning to recover from the devastating military defeat it had suffered. The Virginia Military Institute was highly recognized for its civil engineering program and the South badly needed to repair its bridges and railroads. At VMI cadets suffered, not only of the ravages of war and a disrupted home-life, but because of the system of physical harassment imposed on lower classmen by their fellow students in the upper classes. As a military veteran, Hopkins accepted a tolerable amount of structure and subservience. However, he found the amount of hazeing at VMI was not acceptable, and was doggedly adamant about eradicating the system of hazeing. Hopkins was soon joined by two compatriots Greenfield Quarles, from Arkansas, a Kentuckian by birth, and James McIlvaine Riley from St. Louis, Missouri. They both shared the shame vision of eradicating hazeing at VMI. These three men began a movement to completely abolish the hazeing system at VMI. Their efforts climaxed on a moonlit October night in 1868, presumably following Bible study at the superintendent's home, when the three met at a limestone outcropping on the edge of the VMI parade ground. Hopkins, Quarles and Riley clasped hands on the Bible and gave their solemn pledge to form a brotherhood of a new society they called the Legion of Honor. The Fraternity's spiritual birth, however, actually occurred in 1866, the year the Founders entered VMI, when James Frank Hopkins first rebelled against hazeing at the Institute. The Founders did not create Sigma Nu with any feeling of animosity toward others; rather they were prompted by the impulses of sympathy and affection for all people which underlie abiding peace and contentment. Although Sigma Nu Fraternity began in October 1868 as the Legion of Honor, its existence was kept secret until the founders publicly announced their new society on the first day of January 1869, the accepted birth date of Sigma Nu.